The Rev. Darrick McGhee was seething. 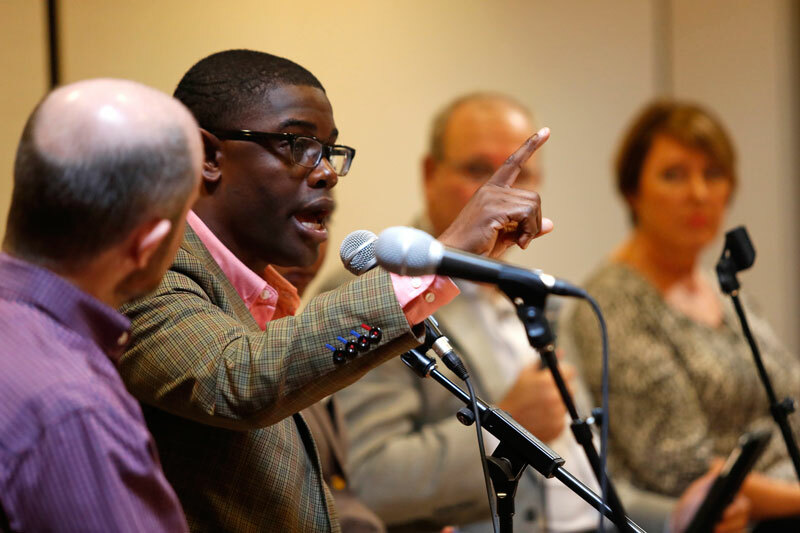 He and four other clergy were gathered at one of their regular public meetings to talk about tough issues, and that day they were trying to make sense of the latest shooting of a young black man. As the hour dragged on, McGhee silently rocked back and forth on his stool. His fellow panel members talked about gun control, the right to bear arms -- anything but race, the real issue at hand, he thought. When he could no longer remain silent, McGhee, the only black member of the panel, finally spoke up. With tears running down his face, the father of two recalled how months earlier his son had told him that one of his white classmates had called him the N-word. “I honestly thought I could protect my son and my daughter from that happening to them,” McGhee said. 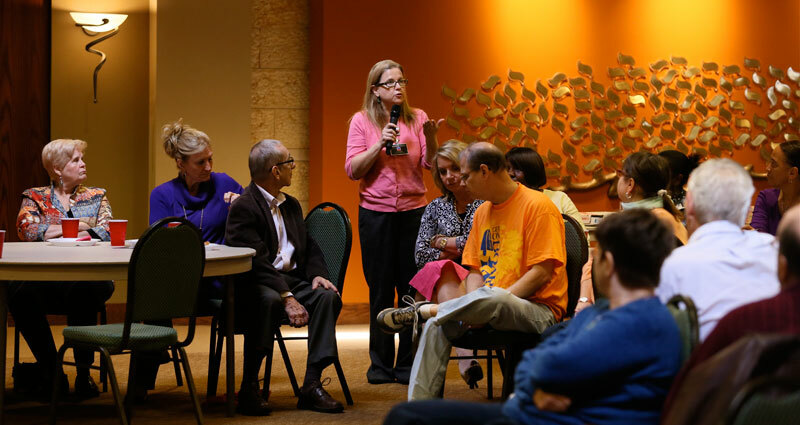 Creating a forum for that kind of moment is the purpose of the God Squad, a five-member clergy group that since 2011 has convened a public gathering at noon one Friday each month in Florida’s capital city. It was created to offer people of faith -- progressives, moderates and conservatives -- a safe space to show the world that debate doesn’t have to be disorderly, that people with differences don’t have to be detestable. The idea is not only to offer a time and place for difficult conversations -- topics have included abortion, gay marriage, police killings of black men, racism, injustice and social inequality -- but also to model the way that people of faith can conduct such a discourse civilly. The group, which has had a number of members over the years, currently includes a Reform rabbi, a Roman Catholic priest, a United Methodist minister, a Southern Baptist pastor and McGhee, a nondenominational minister. It’s hosted by the Village Square, a local nonprofit with a mission to promote civility. Several hundred people turn out each month to discuss the issues and to hear from the panelists, who often disagree with one another. Organizers of the God Squad describe its creation as a divine intervention. It arose out of a friendship between two clergymen from different backgrounds and blossomed into a movement. One morning in 2011, Rabbi Jack Romberg of Temple Israel and the Rev. Dave Killeen, the rector of St. John’s Episcopal Church, were having breakfast at the Uptown Cafe, a popular Tallahassee eatery. The two men had spent many hours together since Killeen had arrived in town the year before and Romberg had invited the young clergyman for coffee. Their friendship soon evolved into an interfaith collaboration. They’d preached in each other’s pulpits. They had led several courses together, including a class in which they paired scripture from the Old and New Testaments and studied the Bible together. Volunteers from St. John’s had helped slice the hundreds of pounds of pastrami for Temple Israel’s annual Tallahassee Jewish Food & Cultural Festival, and members of Temple Israel had helped with the St. John’s Christmas market. What existing relationships could you leverage to create new opportunities? That morning over breakfast, the two clergymen were brainstorming more ways their congregations could study together. It was then that Liz Joyner, one of Killeen’s parishioners, walked in. They asked her to join them. Once she learned that Romberg and Killeen wanted to work together, Joyner jumped in. While Village Square events encouraged a diversity of voices, they were secular. People of faith didn’t feel free to express their views in the public square, Joyner had found. The trio set out to change that. “It was definitely a divine intervention when the three of us got together over food and hatched a plan to bring the city together over food,” said Killeen, who sees the God Squad’s mission expressed in Psalm 133:1: “How good and pleasant it is when God’s people live together in unity” (NIV). Christians also have an obligation, based on the teachings in 1 Peter 3:15, to “be ready to give an answer to everyone who asks you to give a reason for what you believe,” said the Rev. Dr. Gary Shultz, who represents First Baptist Church of Tallahassee on the God Squad. What need or hunger does your ministry fulfill? What structure could you create to better fulfill it? The God Squad not only offers a forum for discussion, Killeen said, but also satisfies a basic human need, for sustenance and fellowship. Building on Romberg and Killeen’s close relationship, they set out to find other clergy who would make the best fit. The group was going to tackle difficult conversations and still had to remain civil, respectful friends. The Village Square grew out of a debate over a proposed coal-fired power plant that was causing bitter divides in the city. Joyner had spent the years since its founding honing the Village Square approach, which brings together people who disagree politically to meet and talk face to face. Are there opportunities in your community to heal rifts or old wounds? The Village Square has been praised by the local newspaper as a model of public discourse and now has a three-person staff and a $225,000 annual budget from grants and private donations. It has expanded to other places, including Salt Lake City and Sacramento. To create the God Squad, the trio reached out to the pastor of First Baptist Church of Tallahassee to add a more conservative voice to the panel. A friend of a friend also suggested McGhee, who had grown up in a liberal-leaning family in Los Angeles but had found his ideological home in the GOP while attending Florida A&M University in Tallahassee. After graduation, he had worked in state government, including a stint as an aide to Florida Gov. Jeb Bush. The timing was serendipitous. McGhee was trying to figure out how he could be more public about his faith and political ideology, which had brought him criticism. Their efforts debuted in fall 2011 as Faith, Food, Friday and the God Squad. A year later, Killeen invited the Rev. Betsy Ouellette-Zierden of Good Samaritan United Methodist Church to add a female voice to the group. Three years ago, Killeen stepped down from the God Squad to make room for the Rev. Tim Holeda, the parochial vicar at the Catholic Co-Cathedral of St. Thomas More. For McGhee, the moment when he was able to break through a cerebral discussion to share his personal experience with racism with the mostly white crowd illustrates what can happen at Faith, Food, Friday. “It wasn’t staged. It wasn’t prepared. I was trying to make a point,” he said. “I was trying to say that most of you here would never understand what it means to be black in America, what it means to walk by someone and they clutch their purse or lock their door under the assumption that you would do them harm, to walk around with tailor-made suits on and still be a threat to people. That’s part of the point of the gatherings, Joyner said: bracing conversation that gets people thinking. The typical audience is mostly female, mostly white, with a mixture of retirees and working people. Each season, from September through April, the Faith, Food, Friday lunches rotate among the panel members’ buildings. While the clergy panel talks, the audience eats lunch, which differs depending on the location. At Temple Israel, pizza is typically on the menu. First Baptist, which has a professional kitchen, usually offers Southern fare -- macaroni and cheese, steamed cabbage, butter peas and corn muffins. To eat, attendees RSVP and pay $10. For those who simply want to feast on the discussion, there’s no charge. Joyner or Village Square staffer Leslie Smith roams the audience, offering a microphone to people who want to share their thoughts or ask questions of the panel. Kristin Dozier, a Leon County commissioner, has been attending Faith, Food, Friday since she was a philosophy grad student at Florida State University. She sees the potential of the interfaith dialogue as a force for moral and civic uplift, and wishes the program could reach even more people. “My hope is that we would find more ways to impact a broader array of people in our community and other communities in the future,” Dozier said. It’s difficult to measure the initiative’s broad impact, but there is evidence of small-scale change. For example, since the inception of the God Squad, First Baptist Church members have become some of the longest-term regular attenders at Rabbi Romberg’s study sessions, Joyner said. After Romberg mentioned at a God Squad event that there was a problem getting the school system to accommodate the Jewish holidays, a member of First Baptist reached out to Leon County Schools and the policy was changed. 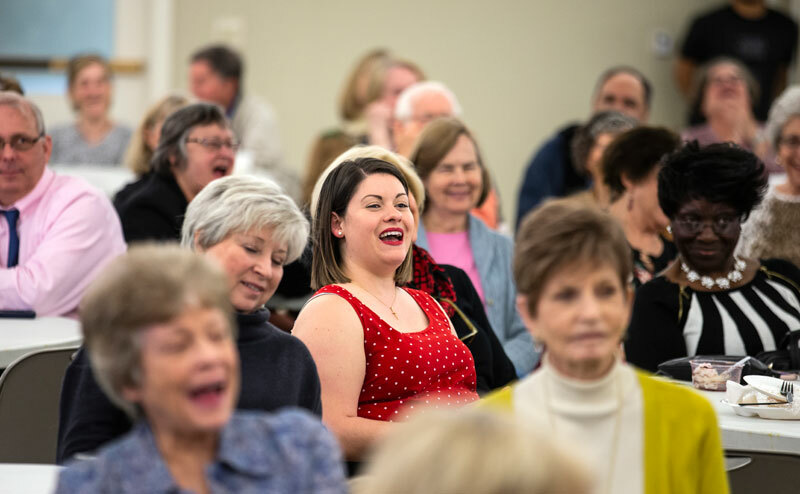 For some in the audience, hearing differing viewpoints and making new connections is part of the appeal. Fundra Hart, a social worker with a faith-based nonprofit in Tallahassee, was one of several African-American women at the February lunch at Good Samaritan UMC. “It gives me a chance to make friends with people of other races and keep in contact with them and see what’s on their mind,” Hart said. For an hour, panelists went back and forth, debating ethics, theology, the definition of the beginning of human life, and even the mechanism of the morning-after pill. Romberg said the Jewish tradition in the Talmud prioritizes fully formed life versus life in the womb. “It is [all] considered to be life, but fully formed human life gets a priority,” he said. “Every human life is sacred,” said Holeda, the Catholic priest, a few seconds later, and McGhee agreed. The Village Square enforces two rules at its public forums. Organizers give a “civility bell” to a conservative and a liberal in the crowd to police their own sides, ringing it when discussion gets out of hand. And they instruct the audience not to support a point of view with cheers, boos, applause, groans or sighs. God Squad members are self-monitoring. 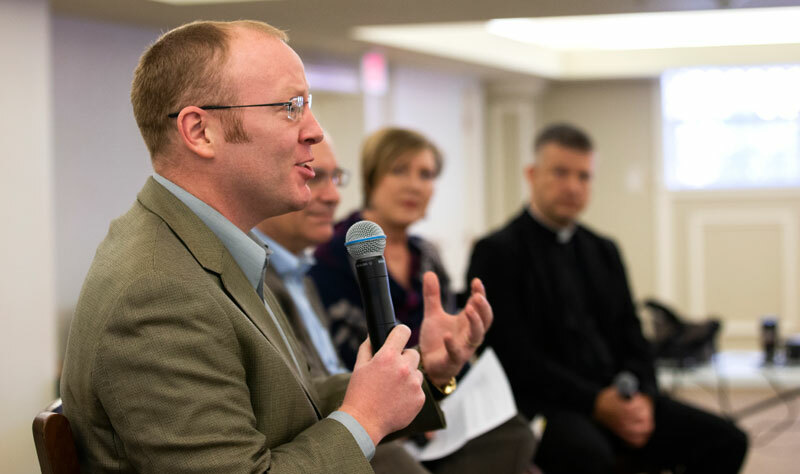 The group models the kind of behavior often lacking in faith circles, said Michael Gulker, the president of The Colossian Forum, a Grand Rapids-based nonprofit that focuses on conflict and Christian discipleship. The secret to the God Squad is the relationships among its members, they say. Ouellette-Zierden hosted her fellow panelists and their spouses for dinner in August 2017 before the season kickoff. McGhee gets together with Romberg for breakfast every few months, and he regularly lunches with Holeda, who has invited McGhee to accompany him on one of his Tuesday fishing trips. Like the Faith, Food, Friday events, some of those social interactions can get intense. Even this group wasn’t immune to the polarizing impact of the 2016 election, for example. Ouellette-Zierden said Romberg and Holeda launched into a heated debate over the Trump election while sitting beside an outdoor fireplace after dinner at her house. But sometimes those interactions also change minds. In 2013, activists staged a sit-in at Florida Gov. Rick Scott’s office after George Zimmerman was acquitted in the fatal shooting of Trayvon Martin. Romberg asked Ouellette-Zierden to accompany him to take dinner for the protesters -- and hear what they had to say. That night, she gained invaluable insight. “I never would have gone up there. I never would have gone out of my way. I supported them from a distance. Jack challenged me to participate. I was changed. I was in a space I wouldn’t have been in if the rabbi hadn’t called,” Ouellette-Zierden said.